Anyone who’s seen as a wine expert is eventually asked the unanswerable question, “What’s your favorite grape?” It’s something like asking a chef, “Hey, what’s your favorite spice?” Or asking a writer, “What’s your favorite letter?” Those questions usually come from people who only know twenty grape varieties, eleven herbs and spices, or damn near 19 different letters. I’ve been asked the first question countless times over the years, and don’t have an answer. I can’t say I have a favorite grape. Though “P” is my favorite letter. And yet I love Grenache. Most often I love it as the ringmaster of great Châteauneuf-du-Pape—Rayas, Pignan, Le Vieux Donjon, Beaucastel, Charvin… How I love those wines. And good Cannonau di Sardegna, I also have a weakness for that (Argiolas’ Turriga always makes me happy). Hell, if I had a Chihuahua I’d name her Garnacha. I can appreciate just about any wine from anywhere, but those wines fill me with joy. It’s strange, and maybe simply personal, but does Cabernet Sauvignon fill anyone with joy? I’ve certainly tasted many great Bordeaux, and countless California Cabernets. But, truthfully, they don’t fill me with happiness. Cabernet Sauvignons seem to affect me in a more intellectual capacity, I marvel at their depth and power and complexity, whereas I experience great Châteaneuf-du-Pape as more visceral, more seductive, more exciting. I swoon. Bordeaux is tall and statuesque, Châteaunef-du-Pape is curvy and voluptuous. I admire Bordeaux. I want to undress Châteauneuf-du-Pape and take her right to bed. Grenache, at its best, has a natural sweetness and depth like no other grape. And it abhors new oak, a fine quality in a grape. New oak on Grenache is like putting a coat of paint on your couch. Makes no sense. People might do it, but then you make it a point never to go back to that house, there’s something wrong with those people. Grenache can often stray into flabbiness, and the cheapest ones always taste like cherry hard candy to me, that’s not a compliment, but those are wines to avoid. Grenache has the desire to overcrop, but I like a little fertility in my grapes—the best producers manage to find the balance in their vineyard and avoid the problems overcropping can bring. OK, that’s enough talk about Grenache. Marcia Macomber is one of the loyalist, longest-tenured common taters of HoseMaster of Wine™. When she asked me if I wanted to pay a visit to Peter Mathis at his lovely little seven-and-a-half acre Grenache vineyard up in the hills above the city of Sonoma, I answered in the way you might expect. I was excited. I said, “P.” I do that when I’m excited, like an anxious dachshund. Marcia does the marketing for Mathis Grenache. But I’m certainly not doing this as a favor to her, though that would be reason enough. I just wanted to visit with a guy even crazier about Grenache than I am. And taste his wines. What producers do you think of when you think of great California Grenache, in the unlikely event you think of great California Grenache? Only wine geeks can produce a long list of memorable California Grenache—Sine Qua Non, Alban, A Tribute to Grace, Villa Creek, Saxum. 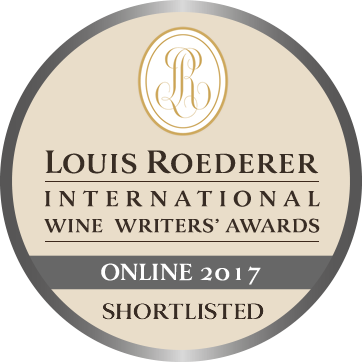 Well, those are some of the producers who make Grenache in its intense, luscious, tiptoeing-on-the-edge-of-overblown style. Confusingly, for the novice California Grenache drinker, there is a style of Grenache that is more delicate, more refined. Less about power and more about finesse. In that category I think of Skinner, Quivira, Unti, Bonny Doon—all quite delicious. Mathis falls in the former category, and, I think, is headed for greatness in the category. The trajectory of the vintages I tasted, 2007 through 2010, would seem to make it likely. Peter Mathis, a former furniture maker turned winemaker, something of the old switcheroo given how many winemakers end up using a lot of wood in their wines and seem like furniture makers, cleared his small property himself, then planted it in 1999 and 2000. The Mathis vineyard isn’t completely Grenache, there are parcels of Carignane, Petite Sirah and Alicante Bouschet as part of the field blend as well. So the vineyard is still very young. 2004 was the first vintage of Mathis Grenache. Even with all of his winemaking experience (Peter is winemaker and GM of Ravenswood), it takes time for a winemaker to learn his vineyard, and for the vineyard to mature. Tasting the four vintages one after the other, on different nights, of course, was really interesting. Each wine had something interesting to say, and as a group, they described Peter’s interesting path to produce world-class Grenache. The Mathis 2007 Grenache Sonoma Valley is a real blockbuster. I’m glad I served it with roast lamb. It’s a concentrated elixir of blackberry, blueberry and mulberry that took quite a while to open up and show its breadth. There was never any doubt it was going to blossom as it sat in the glass; you could tell from the first it was beautifully put together. I got a sense right away that it was holding back a bit, had the sort of restraint that interesting wines always have. The best wines only hint at what’s to come if you show them some patience, give them a chance to unfold. Pedestrian wines tend to give you everything they have first chance they get—boorish behavior. The 2007 Mathis brought to mind the Reserve style of wines now so trendy in Châteauneuf-du-Pape, those Parker darlings, though without, perhaps the class and pedigree. At any rate, this is flamboyant Grenache, maybe a bit too exuberant to be profound, but the roast lamb, covered in fresh herbs, had a way of calming the Grenache’s exuberance. For all of its admirable qualities, it was, in an awkward adolescent way, rather gawky and all elbows. The lamb kept it focused. 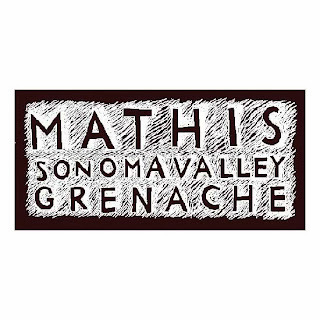 The Mathis 2008 Grenache is a vintage currently available on Peter’s website. I like the wine a lot. I don’t know, the wine just seems happy to be Grenache. Yeah, I know, that’s stupid. But haven’t you tasted wines that just seem miserable? Orange wines always seem miserable to me. Just like people, it has to be their upbringing. Anyhow, the 2008 Mathis is very nicely made wine. It has a nice balance between the intense fruit, I’d call it framboise and black cherry, the nice whisper of herbs, the big-boned tannins and the overall acidity that carries the fruit and keeps it from being gooey. This is Grenache in its small berry incarnation. That telltale sweetness at a lower alcohol than, say, Zinfandel, yet wonderful delineation of flavors. I think it takes a pretty talented winemaker to pull off Grenache like this. One false move and the wine falls off into flabby and cloying. From such a young vineyard, it’s very impressive Grenache. And that reflects the care and attention and fanaticism of a guy who just loves his vineyard. Would I be able to taste that care and attention to detail if I hadn’t visited Mathis? No. Of course not. But just as your appreciation for a work of art is heightened the more you know about its history and symbolism, so can a wine speak to you differently once you’ve walked the vineyard. Truly, that’s one of the best parts of wine appreciation. Any time I taste a Mathis wine in the future, I’ll recall that nifty little vineyard, it’s perfect Southern aspect, and Peter’s obvious love for that piece of land. The Mathis 2009 Grenache is an abrupt change of pace from the two previous vintages. It relies more on brains than muscle. I let this wine sit around for several days--just as an experiment, not because I didn’t want to kill the bottle the first night. I think I liked it best on the third day. From the beginning, it’s prettier than its siblings. It doesn’t quite reach the framboise stage of sweetness, but leans more towards pomegranate and cherry, and has more noticeable pepper and juniper berry, which emerged more each day. By the third day, the Grenache had shed all shyness and spread all over the palate. It was a very slow reveal, like a reunion at The Old Strippers Home. It takes a well-made wine, with a solid core of fruit and good balance, to improve over the course of three days. Lots of wines do fine for a day, and that’s all you really need after all, but it’s always interesting to watch a young wine evolve over a long period of time. It teaches you about structure and balance, and gives you a good idea of the wine’s ageability. The 2009 Mathis Grenache will certainly do well in a wine cellar for at least another ten years. Finally, there’s the wondrous Mathis 2010 Grenache. I thought this was the best of an impressive bunch. It’s not released yet, to my knowledge, but it’s a wine to put on your wish list for next year. (Meanwhile, don’t hesitate to try the ’08 and ’09, learn a little something about Grenache.) In the 2010, Peter captures the best parts of the ’08 along with the best parts of the ’09. I got the sense he’s simply figuring out his vineyard. It has to be hard, I’ve always thought, to figure out a vineyard when you only get one shot a year at it, and the vineyard is evolving along with you. There have to be bumps along the way. Yet, there are also triumphs. Here’s your triumph. Both brains and muscle, the ’10 manages to impress all the way around. From the nose you might think the wine is over-the-top with all the black cherry, raspberry jam, pepper and a dash of framboise. But when you taste the wine, it’s the acidity, the backbone, that pops, and, bang, you’re in Grenacheland. You might be in Châteauneuf-du-Pape for all you know. With our hanger steak (you don’t want to know what a “hanger” was to my brother and me when we were kids, but you’d never grill and eat it) the Grenache was really good, quite satisfying. When the wine disappears as quickly as this bottle, you know you matched the food with the wine successfully. Peter Mathis is doing great work with Grenache up above Sonoma. I don’t see his name listed often among desirable Rhone Ranger producers, though perhaps he is and I don’t see it. The focus seems to be on Paso Robles and the Sierra Foothills these days. That’s all well and good. But if you’re a Grenache lover, Mathis should be in your wine rack. best line ever..."It was a very slow reveal, like a reunion at The Old Strippers Home..."
Argiolas Turriga is one of my favorite wines in the world...I was lucky enough to recently share a bottle of 1994 with Antonio Argiolas over a lunch that featured a dish of various sea foods (gamberi, calamari, salmon, halibut, mussles etc) in a slightly spicy tomato based sauce...off the charts! "Loyalist, Longest-Tenured Common Tater" checking in! Daniel's right - "The Old Strippers Home" line is hilarious! It was exactly what I was thinking at the beginning of your sentence. It was great to see you, Ron, when you came to visit Mathis Vineyard. Glad you enjoyed the wines. "Paint on your couch" - Where do you think of these things??? I love Grenache as much as you do! thanks for the heads-up, I will look for Mathis. wow, you do wine reviews too! Who knew?! But were any of them "Burgundian"? I guess we know who Marcia likes best, I only got the current release, oh and the Rose but whatevs, they were both wicked delicious. First thing out of my mouth when I tasted both, "Damn, that's pretty". I too relished in the vibrancy and delicate touch on the Grenache and the Rose, well I only wish it had been released earlier, we would have sold tons of that racy, lip-smacking stuff. As always Love, your notes are a delight to read. Now, speaking of lip-smacking, get down here and kiss me! It's been a while since my last Wine Essay, and Mathis presented a fun choice. There really aren't a lot of people in California making a single wine (and a tiny bit of Rose) from a vineyard they planted themselves to a variety they love. I think that's cool. On top of that, he's a talented winemaker. So, yes, Martin, I do review wines now and then, but I don't directly solicit wines. I wait for a winery to contact me, and if the wines seem interesting, I accept samples. And if the wines I accept don't excite me in some way, I don't take the time to write a long review. In my own head, I always think I'm the only one who actually reads them all the way to the end. It was kind of Peter, and Marcia, to give me four different vintages of Grenache to review. It was eye-opening and educational in a way that all the talk in the world can't replace. Thanks to them. The Mathis Grenaches are terrific. If you love Grenache, go to the damn website and buy some! Thanks for reminding us that you're serious about wine. It's just people who are seriously funny. Just catching up. Loved your tale about the (formerly) young super-taster. But, really, don't you think he'd pick up on that "dash of framboise" in the Mathis 2010 Grenache?
" In my own head, I always think I'm the only one who actually reads them all the way to the end. " So many words. What can they all mean? Who is going to read a wine review that does not have points? I've always been serious about my love for wine, and about comedy. I just hope I'm not as bad writing seriously about wine as so many serious wine bloggers are pathetic when they try to be amusing. Fairy tales are fairy tales. The young boy was fooled by a fish. How smart could he be? As you know, none of my pieces have any points. It's what I do. At least I know I'm pointless. Thanks for introducing me to a new producer of one of my favorite grapes! Up here in Oregon we occasionally get the non-purple-drank versions of grenache from Washington and S. Oregon but more often grenache seems to make dark, oaked to hell cherry cough syrup. Very disappointing. Have you tried William Allen's Two Shepherds label? You might enjoy his take on grenache and Rhone varieties. Only thing I don't agree with is where you put A Tribute to Grace, I think Angela's wines are much closer to Unti and Bonny Doon myself. Peter Mathis seems to like flying below the Grenache radar. It's hard to even find a recent review for his wines. He seems content with word of mouth. I just thought the wines went from strength to strength. You're right about A Tribute to Grace. Angela's wines are beautiful. I lumped her into the wrong category because I had confusing categories. Thanks for pointing it out, Beau. I began with just listing the roster of "cool" Grenaches, then I changed horses midstream. Confusing paragraph, really. I need an editor. thanks for the mention Beau, much appreciated. Ron has had TS a few times, but it may have been awhile. Can't remember if he made our Rhone Rangers Grenache Day tasting, given it was in the blur of harvest. My love for Grenache goes way back, before it was even a twinkle in California's eye. It was in California, but rarely done as a single varietal. Now it's "hot." I'm glad for that, nice to see it get its due. It certainly is a grape with which one can easily fall in love. Though I'm waiting to taste a really good Grenache Gris. From anywhere. Ah well, there's always 2014! Thanks for chiming in. Now turn off the goddam Google alert. Lo Hai Qu is A Wine Judge!